Our ZIROX grinding media is available as either a medium-density bead or high-density. 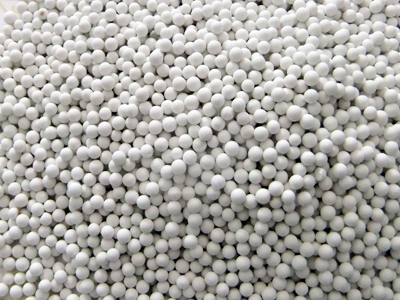 In many applications the higher cost of ZIROX beads will be offset by their longer life. ZIROX is also commonly used for milling lighter shades of paint, ink, and color dispersions where steel media would otherwise discolor the product. -An economical alternative to glass beads. All Zirox-A beads are narrow range. ZIROX-TZP is the highest density non-metallic Grinding Media we offer. The cost per pound is higher than ZIROX-A but the life expectancy is much greater and in most cases outweighs the extra cost. This extra life will very often more than justify the extra expense especially when also considering the reduced mill downtime due to media changes. Bead fragmentation is virtually nil thereby eliminating problems associated with clogged screens. NOTE: Other sizes are available. Please contact us to inquire. ZIROX-CE is a high density non-metallic grinding media well suited for fine grinding in today’s media mills. The cost is higher than Zirox-A but wear resistance and density is greater. Our economical PERLITE silica glass is specially formulated for optimum results in all high speed bead mills and sand mills. These beads have high impact and cruising strength. They are spherical and free of tails, surface cracks and fused pieces. Sigma DURMAX Grinding Media is available in chrome alloy steel, Carbon steel or stainless steel. This media is especially popular for use in the manufacture of printing inks, magnetic tape coatings and various other applications. The superior manufacturing process used for DURMAX beads results in highest wear resistance and fewest media changes.